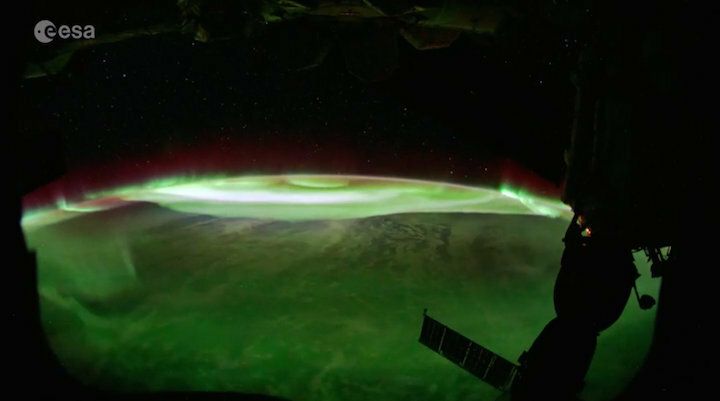 An astronaut on the International Space Station (ISS) has shared some stunning footage of the Aurora Australis, otherwise known as the southern lights. Italian astronaut Paolo Nespoli captured this beautiful aurora display as the ISS passed over the Southern Hemisphere. The display's vibrant colors lit up the southern sky as the Antarctic Circle was just emerging from the long winter night. While Nespoli took the video on Aug. 20, the European Space Agency (ESA) released it on Sept. 15. The sun has been quite active lately, even though it's entering the winter of its 11-year cycle. This aurora comes on the heels several powerful solar flares earlier this month, including one on Sept. 6 that was the strongest solar blast in 12 years.These bursts of high-energy particles often add extra flair to the auroras, but they can play havoc with satellites, telecom cables and power lines. The Aurora Australis, also known as the southern lights, ripple and dance over Earth in this still from a stunning video by Italian astronaut Paolo Nespoli of the European Space Agency (ESA) on Aug. 20, 2017. ESA released the video Sept. 15. For the Aug. 20 video, Nespoli compressed roughly 15.5 minutes of videography into a dazzling, 37-second time-lapse piece. Nespoli's camera took 919 images per second to record the view, ESA officials wrote in a video description. Another aurora video, captured by Nespoli on Sept. 18 and released on Sept. 23, showcases the brilliant green celestial light dancing over city lights as the space station soared overhead. The ISS has plenty of windows for astronauts to catch shows like this, but the seven, Earth-facing windows of the Cupola offer the crew exceptional views of the auroras as they zoom overhead at nearly 5 miles (8 kilometers) per second. The space station traveled nearly 4,370 miles (7,030 km), roughly the distance from Washington, D.C., to Rome, over the course of the latest video. Nespoli is one of six astronauts and cosmonauts currently living aboard the ISS on the Expedition 53 mission. He launched to the station in July and will return to Earth in December.